Felting is a fantastic craft as it can be learnt in a weekend or even a day, you can make something really beautiful quite quickly and you don’t need very much equipment. I love teaching felt making as the results are always really amazing, with an array of colours, textures and objects. Our felting courses are particularly special as we use our own and locally sourced fleece, which we have naturally dyed using plant dyes, giving a rainbow of colours. This natural palette of colours works perfectly with the landscapes around us -and looks stunning when producing landscape wall hangings. Felt making is an ancient craft which is practised all over the world. 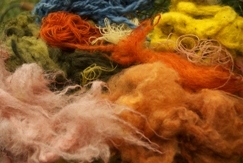 It is easy to see why felting has been adopted so widely as it is a fast, practical technique to bond wool fibres and can be used to make clothes and larger pieces of cloth. In the summer of 2010 I travelled to Mongolia to learn some of the techniques the nomadic herders of the Mongolian steppe use. Sheep, wool and felt are an essential part of life for a Mongolian herder and their moveable homes (Gers) are made from large pieces of felt, as are many items of clothing, decorative wall hangings and floor mats. If you would like to find out more about my trip to Mongolia then please have a look at our blog. 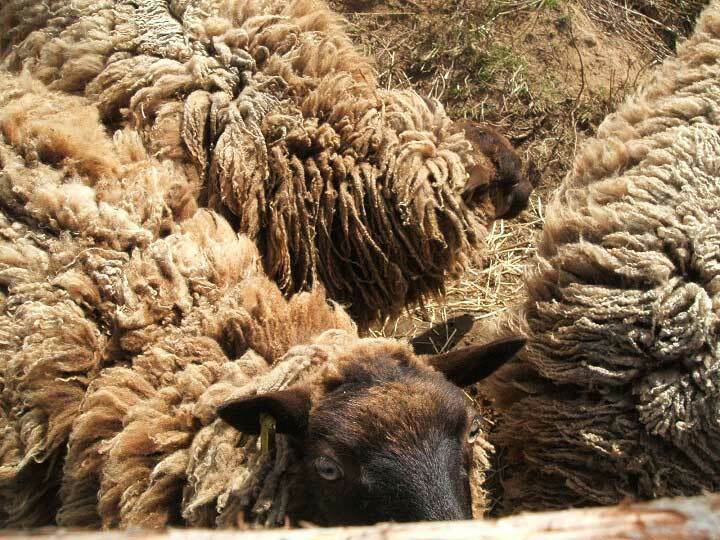 The weekend will start by learning about the differing qualities of fleeces of various breeds of sheep. We will then cover carding, the process of separating the fibres. 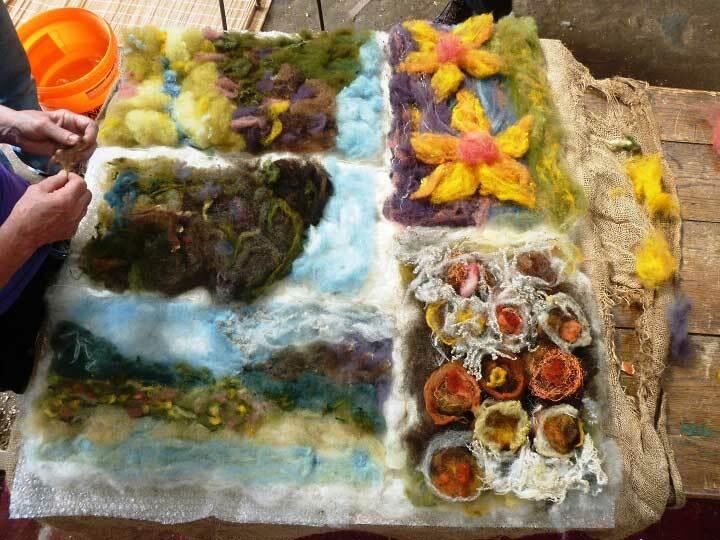 We will use a couple of felting techniques, to begin with wet felting, using soap, water and friction to felt. 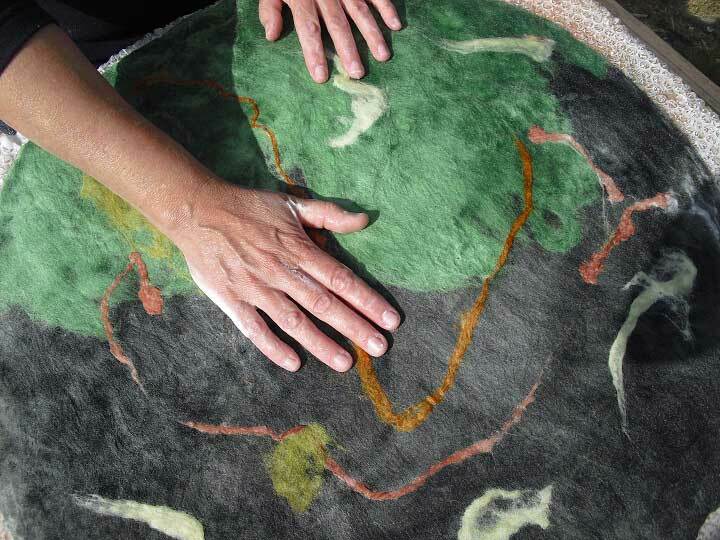 You will learn wet felting by hand, rolling and throwing. Wet felting can be used to make seamless bags, hats, scarves, wall hangings, slippers, cushion covers and more…. During the weekend we will also try needle felting, to add detail to our wet felted pieces and also make smaller more detailed pieces such as brooches, flowers and birds. Courses are run from Saturday 10am to Sunday 4pm and the price includes all materials, lunch on Saturday and lunch on Sunday. You can choose to stay in a local B&B, hostel, static caravan, campsite or stay in our yurt in the woods. Our personal recommendations for these can be found on our Accommodation page. If we don’t have any dates which suit you, let us know and we can arrange a workshop just for you and your friends or family.